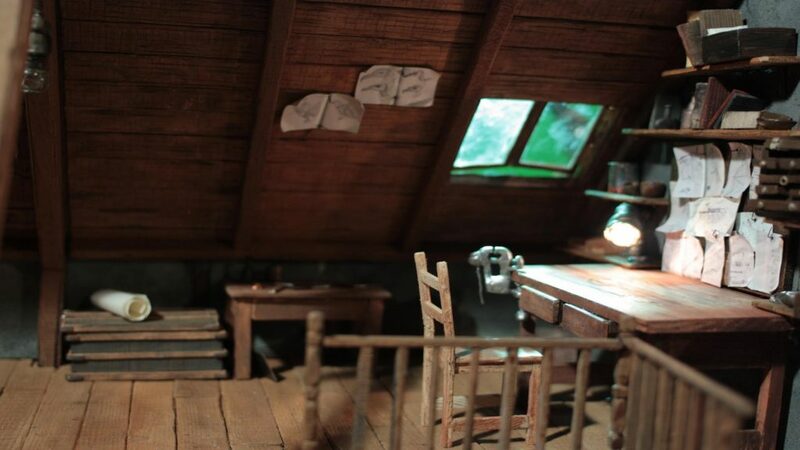 This was the main miniature set for my graduation film ‘Moonbird’. All the set pieces and props were made by me. 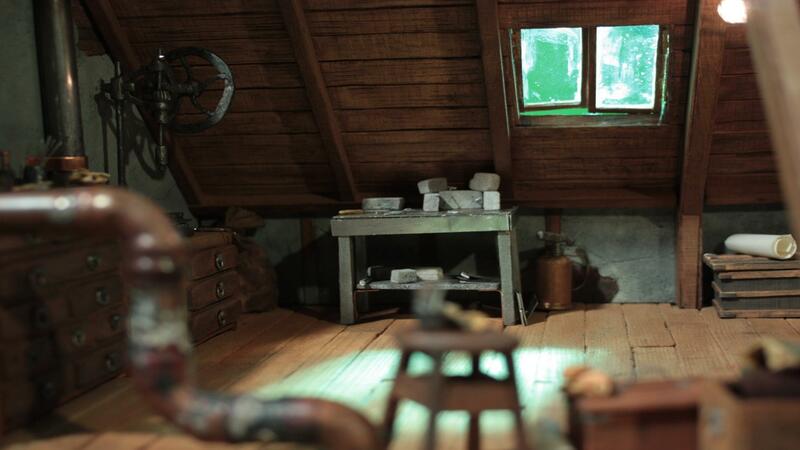 The miniature attic set was used in my graduation film as background stills (and some moving shots). Because the film was a combination of live action and stop motion and the bird armature is quite big, I decided to keep all three elements separate and composite them together using After Effects. 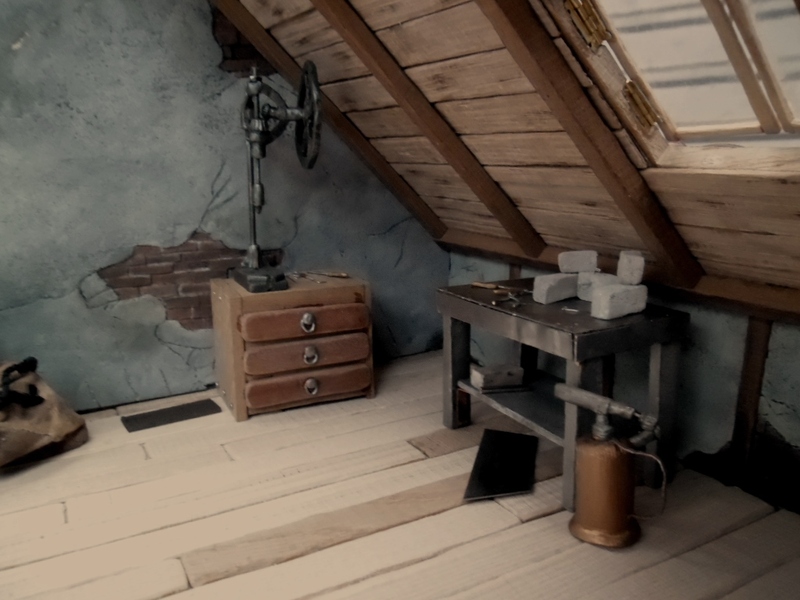 This meant I could build the attic set a lot smaller, which made it more achievable to finish everything. 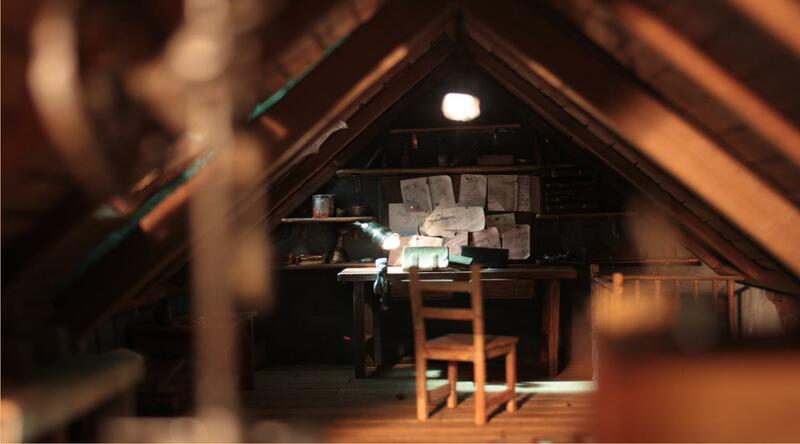 The attic set was built as a complete ‘box’ with every wall and roof piece being separate and easily replaceable. This was important for two reasons: I needed to film shots from almost every corner, and since the set is very small I needed to take out the walls where the camera would be. 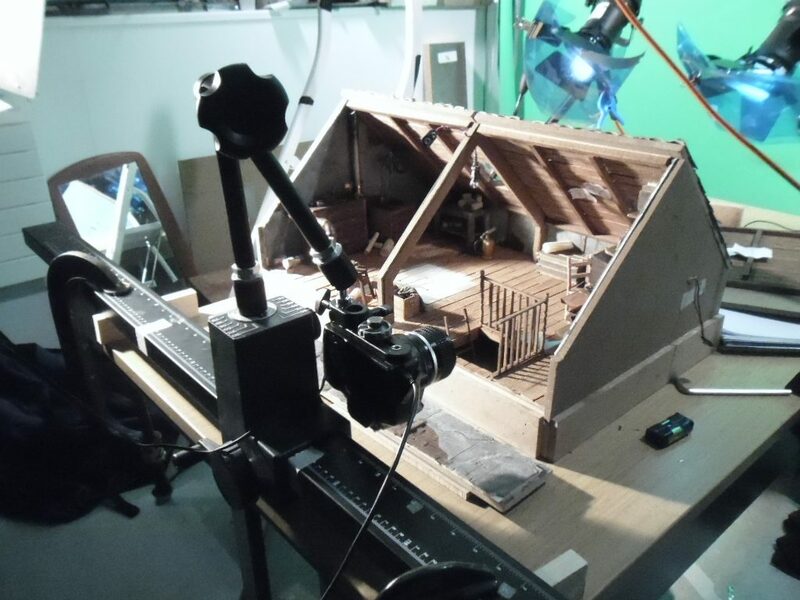 The second reason was that even in the wide shots where you see a lot of the slanting ceiling, it wasn’t possible to get enough light into the set with all the roof pieces on. I would take several pictures from the same position – with and without the roof sections on – and combine these later, to ensure having the correct lighting as well as being able to give an impression of being inside this small closed space. 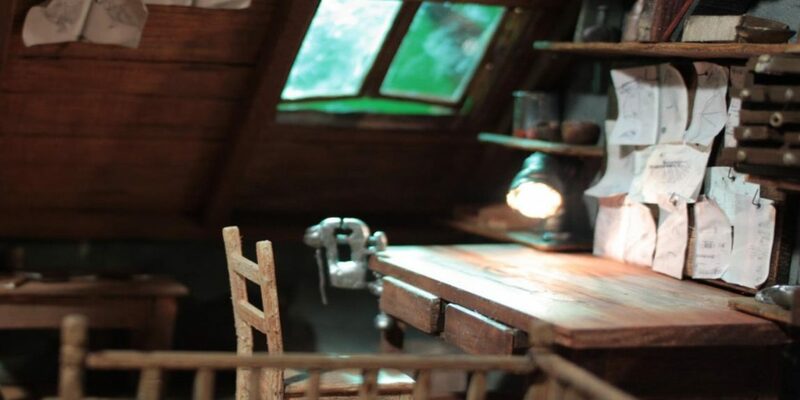 In the final film there are some elements in larger scale which I then combined in After Effects with the small scale set, such as the top of the desk and the edge of the window. I also made use of a combination of practical lights (little light bulbs for the desk lamp and ceiling light) and lighting as well as a ‘3d’ lighting effect in After Effects that helped bringing the different layers together. 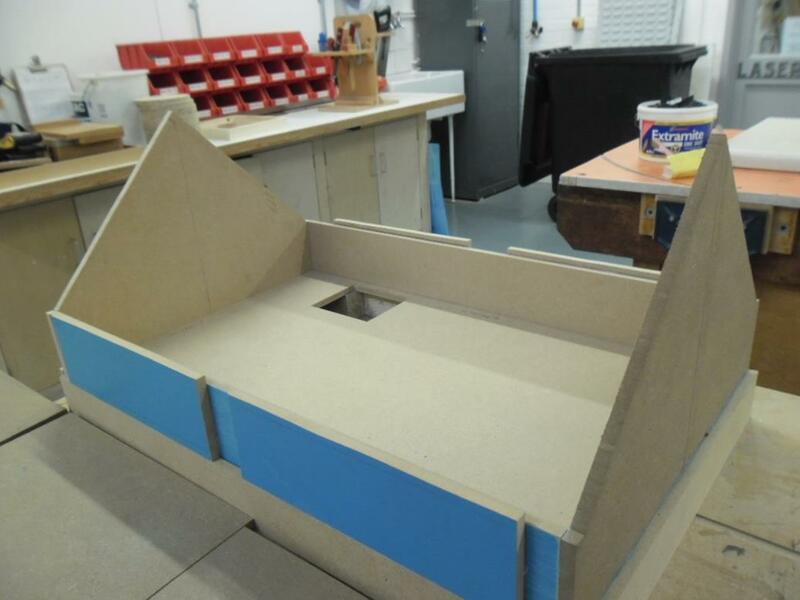 The main structure of the set was build from MDF. All the floor and ceiling boards are strips of wood I cut from off cuts of different hard woods on the band saw and then painted/treated with stains, etc. The ‘stone’ walls are made out of model foam board and painted. 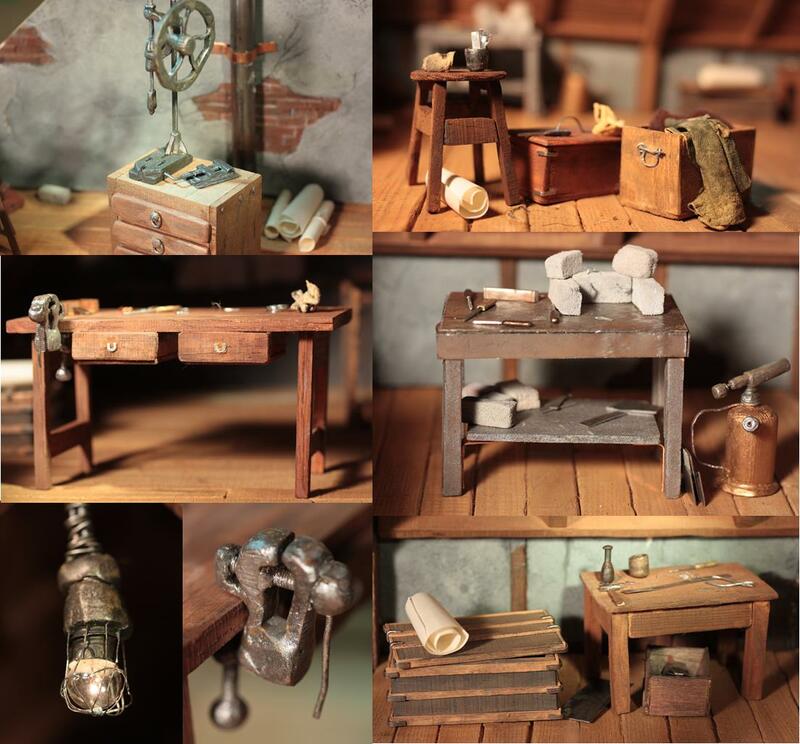 Various props such as the desk, chair, little tables, cupboard, stair railings and chest are also made from pieces of wood combined with other materials. 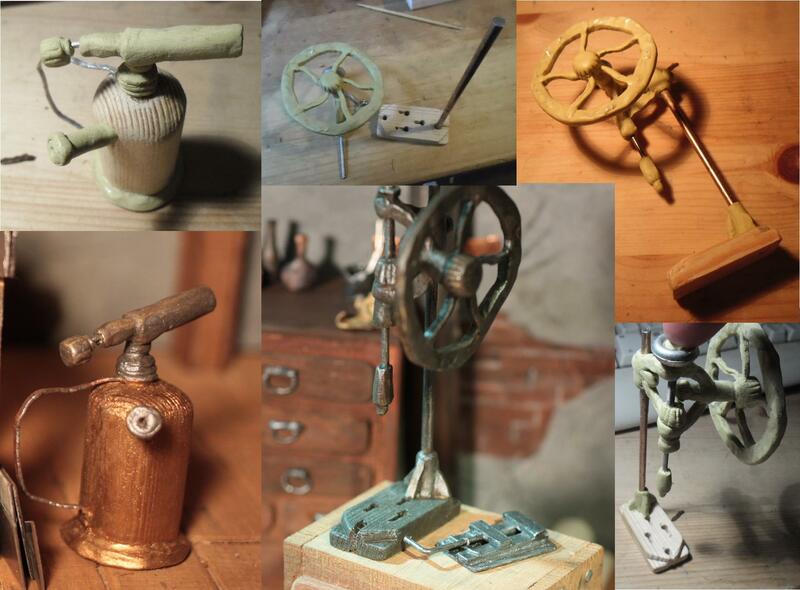 The pillar drill and miniature tools are made out of wire and milliput. 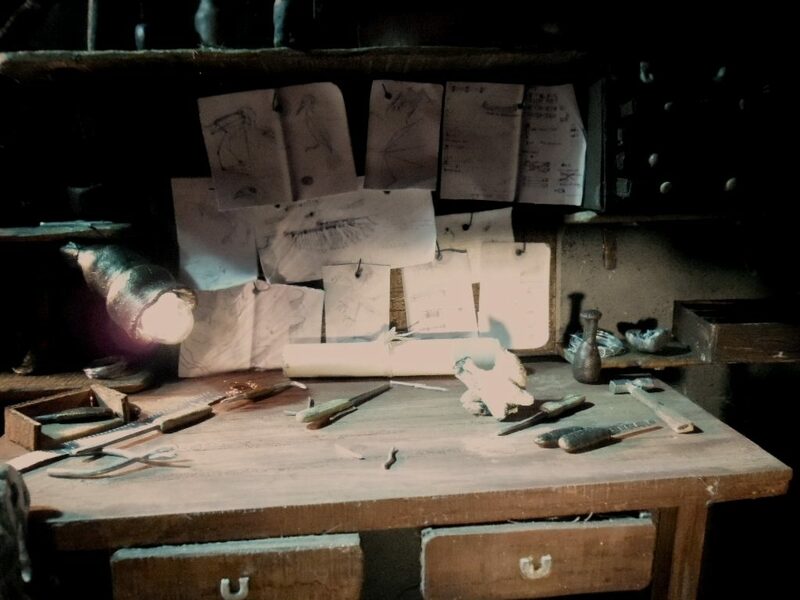 The drawings on the notice board are tiny print outs of actual scale drawings I made when I was building the armature of Moonbird. 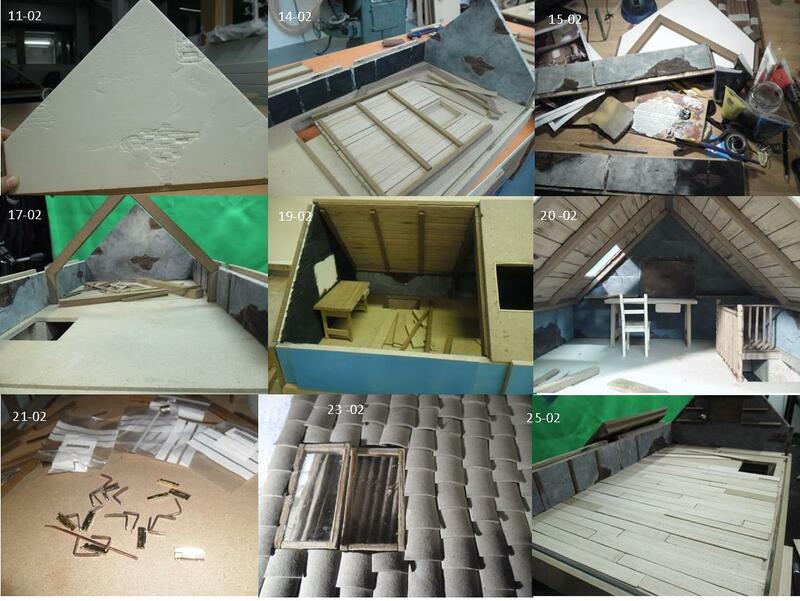 The base structure of the attic set in progress. All the side walls are hold in place in a groove. The extra edge on the low side walls is to rest the roof panels against. A progress time line of some stages of building, including progress of the 'stone' walls and roof tiles. 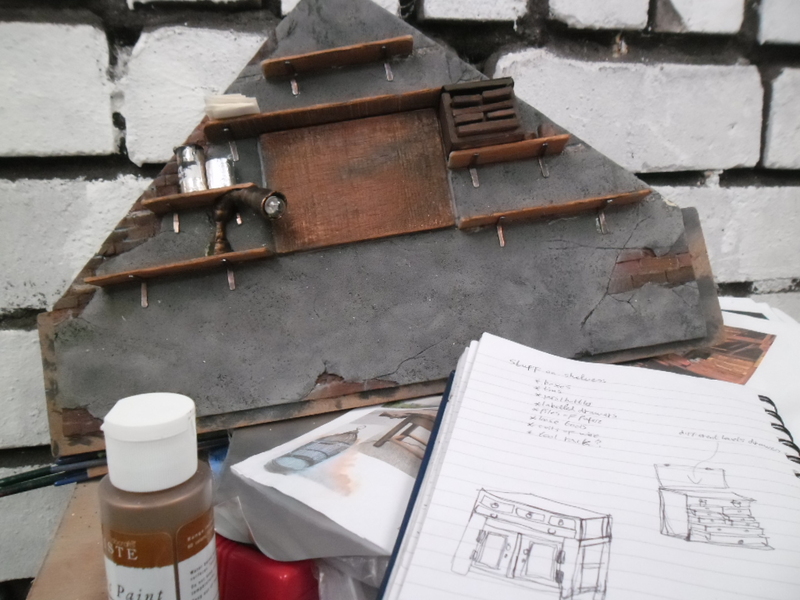 The front wall panel in progress, design drawings for props and reference pictures in the foreground. The roof panels from the outside. 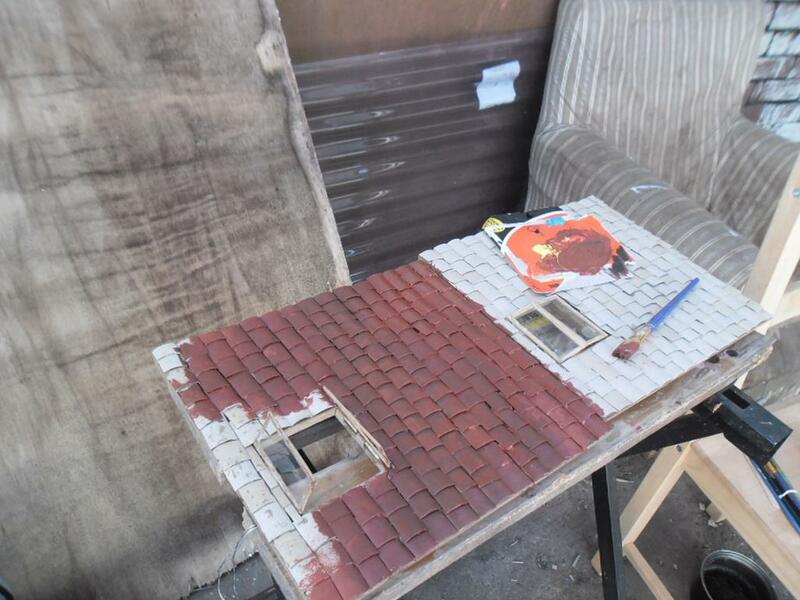 The roof tiles are made out of cut up toilet roll tubes. 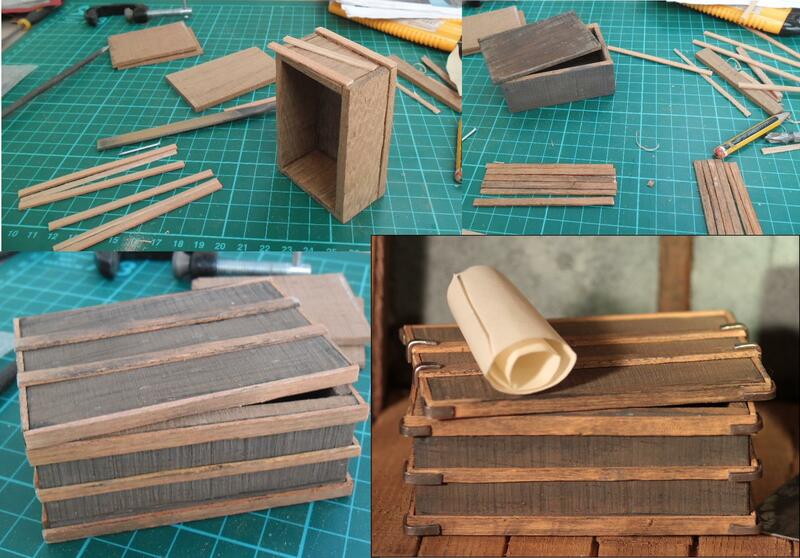 Building of a wooden chest. Building the pillar drill and gas tank props, out of wood. metal, wire and milliput, painted with metallic paints. The attic is starting to fill up with furniture and props. 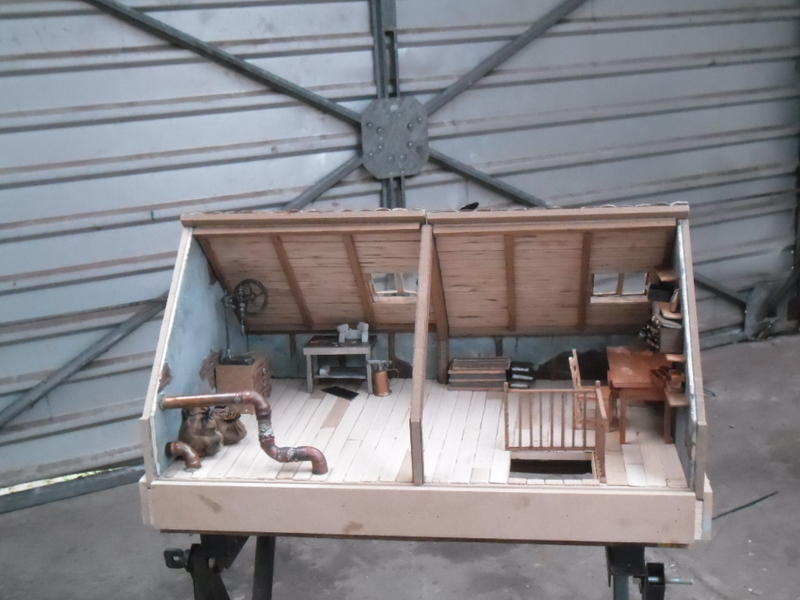 The assembled attic minus one side of wall and roof panels, with nearly all the props finished. 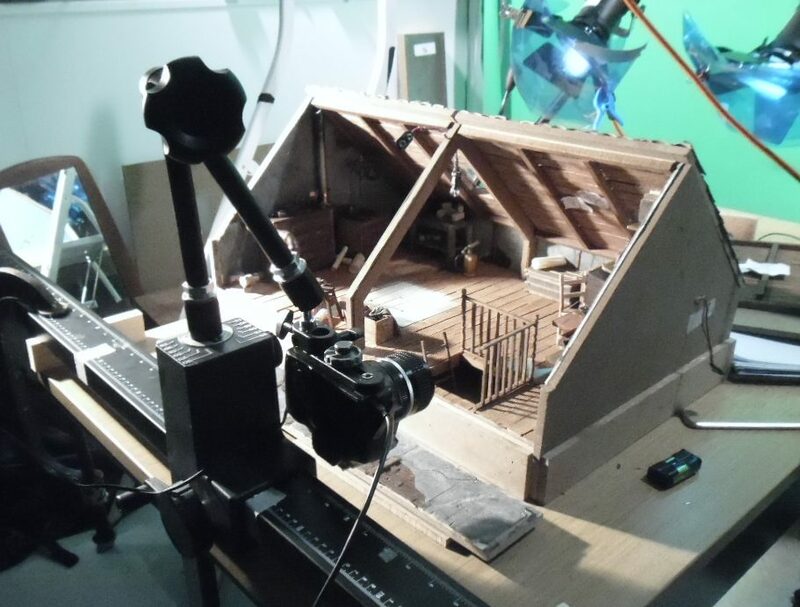 Attic set, set up for shooting moving camera shot.